Mixed Thinks – a podcast featuring fun conversations with local notables on advertising, culture, marketing strategy and insights on how personal journey can lead to professional success. They top it all off by getting their favorite mixed drink recipe, too! Listen in and learn from these lively conversations while you try some fun new libations. Tony Bock & Special Guest Host Emily Sorenson of HenkinSchultz Creative Services in Sioux Falls, South Dakota, welcome HS Executive Creative Director Chad Vander Lugt to Episode 5 of Mixed Thinks. Join them for a fun chat on creative directing, digital strategizing and an award-winning Harry Caray impression. Holy Cow! Recipe for a TnT Ingredients: Tequila Tequila Directions: Take the first tequila and mix it with the second. The creativity will explode from there! 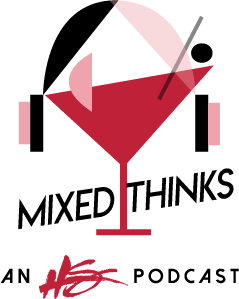 Tony Bock & Special Guest Host Mike Knudson of HenkinSchultz Creative Services in Sioux Falls, South Dakota, welcome South Dakota Advertising Federation Executive Director and KELO-FM morning radio personality Shannon Steffke to Episode 4 of Mixed Thinks. Join the crew for a fascinating discussion about what the AdFed does, starting and/or changing to a career in marketing, and the importance of branding. Recipe for Fizzy Water Ingredients: H2O Carbonation Directions: Carbonate the water for a refreshing fizz! Pure, clean and simple - just like a great brand. Tony Bock & Special Guest Host Toby Kane, of HenkinSchultz Creative Services in Sioux Falls, South Dakota, welcome internet personality and social media superstar Jennifer McNamara (or as you may know her: @Jenimc) to Episode 3 of Mixed Thinks. Enjoy a rollicking discussion on all things social, from growing your platform to corporate social media strategy to whether or not you should be on Vero! Recipe for the Tequila and Shame Ingredients: Tequila Shot glass Directions: Put the tequila in the shot glass. Drink it. Repeat. The shame comes later! Tony Bock & Taylor Litzen, of HenkinSchultz Creative Services in Sioux Falls, South Dakota, welcome stand-up comedian, actor and producer Nathan Hults to Episode 2 of Mixed Thinks, for a hilarious discussion about launching a new comedy venue, marketing yourself as a comedian and the place of humor in today's social media landscape. Recipe for the Finlander Hults Ingredients: Crown Royal 7 Up Peach Schnapps Directions: The setup: A glass with ice, Crown Royal whiskey and 7 Up. The punchline? A splash of Peach Schnapps. Giggles will soon follow. Tony Bock & Taylor Litzen, from HenkinSchultz Creative Services in Sioux Falls, South Dakota, welcome Eric Van Beek of the HS Sign Shop - and former radio dj - to the first episode of Mixed Thinks! Recipe for The Arnold Palmer Ingredients: Glass Ice Lemonade Tea Directions: Fill glass with ice. Pour half the glass with lemonade, and half with tea. Eric likes to bask in the glory of his two ingredients separated, we prefer ours MIXED.